Drugs are commonly used in conjunction with therapy to reduce the effects of Anxiety Disorders. One of the purposes of psychiatric medications is to relieve a person’s symptoms enough to allow therapy to be effective. This has been a standard approach for years. A radical new approach to drugs and therapy has been proposed by researchers and published in the June 15, 2008, issue of Biological Psychiatry. Instead of using drugs to relieve symptoms, they propose using certain drugs to enhance learning during therapy sessions, improving the effectiveness of behavioral therapy treatment for Anxiety Disorders. Anxiety is a normal human response to stress. But in some, it can develop into a disabling Anxiety Disorder with excessive and irrational fears, such as Obsessive-Compulsive Disorder, Panic Disorder, or Post Traumatic Stress Disorder. Effective treatments are available and can involve behavioral therapy, medications, or a combination of both. It makes intuitive sense that combining these two treatments [psychiatric medications and therapy] would result in even better results. However, Tolin notes that this has unfortunately not been the case. The majority of the evidence suggests that combined therapy is no more effective than behavioral therapy alone, and in some cases can even be less effective. Psychotherapy for Anxiety Disorders depends upon the patient’s being taught by the therapist new ways of thinking, acting and reacting to the fears they experience. It often involves what is known as exposure therapy, in which a patient is gradually exposed to the feared situation or object and learns new ways of managing and controlling those fears. As stated, psychiatric drugs often are prescribed along with therapy to help the person to cope with their fears while therapy is taking place. Recently, several researchers have tried a radically different approach: instead of just throwing two effective monotherapies [i.e. 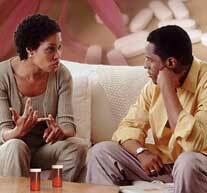 drugs and therapy] at the problem, they have instead looked at medications that specifically target the biological mechanisms that make psychotherapy work in the first place. There has now been a sufficient amount of research in this area to take a step back to look at the basic research conducted in animals and the initial clinical trials [with humans]. The study involved the addition of D-cycloserine, an old drug long approved by the U.S. Food and Drug Administration for the treatment of tuberculosis, to exposure-based fear treatment. The research’s meta-analysis, a pooling of the published literature on this approach, provides evidence that D-cycloserine enhances the learning process in the brain. The researchers found that gains due to use of D-cycloserine were generally maintained at follow-up sessions. They also found that it was more effective when administered a limited number of times and when given immediately before or after the therapy session. D-cycloserine was found to be particularly effective for learning during exposure therapy, a major component of therapies for many Anxiety Disorders. It may be best used before therapy sessions to “warm up the brain” and make it more responsive to the treatment sessions rather than as a daily treatment. This study’s confirmation of the effectiveness of D-cycloserine is a positive step forward in improving treatments for individuals suffering with Anxiety Disorders. As research continues, there may be other existing medications found to enhance learning during therapy sessions. Psychotherapy has been proven over and over to be an effective means of learning to manage Anxiety Disorders. Cognitive-Behavioral Therapy has been particularly useful in treating these disorders. This new drug approach only makes this therapy more effective, resulting in fewer sessions required and better learning for the patient. Another very exciting aspect of this work is that it’s one of the few really good examples of translational research in psychiatry: taking basic science from the laboratory … and translating that research into useful interventions. Would you take a drug to enhance therapy? The number of sessions required for some Anxiety Disorders is 8-12, while other, more serious disorders, require many more. This radical approach to the use of medications improves the effectiveness of therapy sessions greatly, both enhancing the learning during sessions and reducing the number required. I have been seeing my current therapist for almost two years, and, although I like him greatly, I would welcome a way to speed up my learning during sessions and to reduce the time that I have to continue seeing him. If D-cycloserine or a similar-acting drug were available, would you use it to enhance your therapy sessions? Do you think that there are other drugs, approved for other purposes, that might be used to treat psychiatric conditions? Do you think that “learning drugs” should be used with psychotherapy at all? If you have enjoyed this article, please consider subscribing to this blog, either via RSS or email at the top of your screen. It’s free! I would also appreciate your sharing it using your favorite social media, such as StumbleUpon or Digg. Just click the little green “ShareThis” button at the bottom of this post. <= Previous Posts Anxiety and Depression: Two Sides of the Same Coin? Mike – That is a really interesting idea. And it sounds like a good one. Use a known drug to assist with learning to assist with the therapeutic process so that drugs used for the anxiety symptoms become less necessary. Also, I’ve been reading your blog but haven’t commented because I don’t have too much to say about the subjects you write about. But I respect how you have opened up to the world and are writing about this topic through your own personal experience. Thank you, Kim, for the compliments! It was “risky” for me to do this blog; I thought about it for a year before I got my courage up. But so many sites were clinical and lacked a dimension of personal experience, so I decided to go ahead and do it. It’s good to know that it’s appreciated. Yea, great blog & very interesting, positive, Social Phobia articles. This is a pretty amazing concept. I used to self-medicate before every therapy session because otherwise I was too anxious to even talk. About 15 minutes before I saw my therapist I would pop a vicodin or ativan, and just as the session began I felt calm and comfortable enough to discuss painful topics. If for some reason I didn’t take a pill, most of the 50 minutes was spent with both of us staring at our shoes or around the room, barely speaking. I completely support prescribing medication that is taken to specifically enhance learning and work in therapy sessions. Its an very nice share. Anxiety disorder, which is often associated with depression and possibly even fatigue, can be one of the fastest ways by which the entire quality of one’s life is destroyed. Anxiety disorder can be a serious illness, often needing emergency treatment right away. The suicide rate for those with anxiety disorder can actually be much higher than those suffering only from depression. Therefore, it is vital that this disorder be kept under control. Thanks for the share. Hope it helps people get inspired to seek a healthy lifestyle. Great article, thanks for taking the time and effort to publish. I feel this is very valuable information!